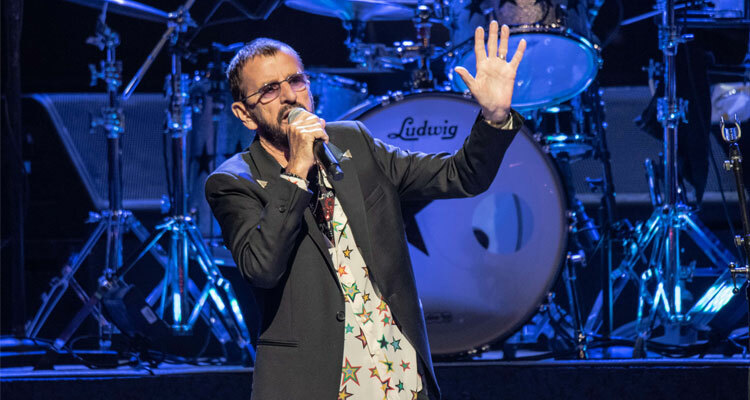 Yes, for to see Ringo Starr in concert is to actually see Ringo Starr & His All-Starr Band, an ever-evolving supergroup that has been touring nearly every year since 1989. Past iterations of the band—all headlined by Starr, natch—have included the likes of Levon Helm, Clarence Clemons, Peter Frampton, Todd Rundgren, and Sheila E. The band’s 13th and current lineup features Steve Lukather (Toto), Colin Hay (Men At Work), Gregg Rolie (Santana and Journey), and Graham Gouldman (10cc). The gimmick? Starr plays some of his best-known Beatles and solo songs, and the other members (“Stars in their own right!”) play two or three of their songs. In theory, it sounds a bit corny; in practice, it turns out to be a lot of fun. That kind of goofball chatter was par for the course. Starr cracked wise throughout the two-hour set, and, incredibly, did a fair amount of good-natured crowd work. Even the between-song material that was clearly rehearsed was gold: Before playing “What Goes On,” Starr noted that it was the only Beatles song credited to Lennon-McCartney-Starkey. “Those credits should be reversed!” he joked. Just imagine being able to make that joke. Beyond Starr, Lukather seemed to serve as the All-Starr Band’s unofficial bandleader, rock-star jamming alongside the rest of the group and occasionally gushing at the material they played. (“I love that song!” he enthused after Hay’s “Overkill.”) Lukather was also responsible for the most unintentionally funny moment of the night, grumbling under his breath about an “alternative band” that had made Toto’s “Africa” and “Rosanna” popular again. Those songs, along with “Hold The Line,” were well-received, because Toto rules. Did Starr play “Yellow Submarine”? Of course he did. Did he play “Photograph”? Yep. Did he play “Anthem,” a song from his 2012 album Ringo 2012? Sure. Should he maybe not have played “You’re Sixteen”? Yeah. And how did the night end? Exactly how you’d expect: with Starr getting a little help from his friends on a winning rendition of “With A Little Help From My Friends.” Not a bad song to have in your back pocket for a closer. The crowd went nuts. Last week, Starr’s former bandmate, a fellow named Paul McCartney, released his umpteenth solo album, Egypt Station. Along with that album came the umpteenth wave of think pieces wondering what McCartney has left to prove, and why he continues to tour. (The answers, it turns out, are “nothing” and “he’s a born entertainer.”) The same could be asked of Starr: What does he have left to prove? Why does he keep doing this? The answers may be less clear, but maybe they have something to do with Starr’s forever-repeated, forever-needed message of “peace and love.” The latter, some band once said, is all you need. At one point during Saturday’s show, Starr noted how he often received just as many “I love you!” shouts from male audience members as female audience members “Hey,” he said, “love is love!” Maybe it is that simple.